HANOVER, Mass. 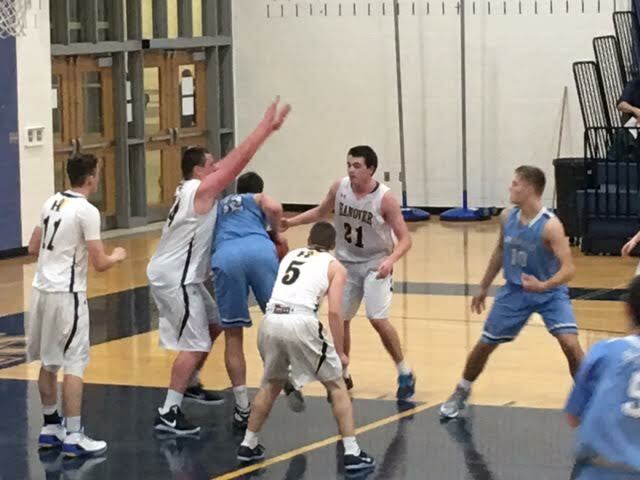 - The Hanover Indians boys basketball team dismantled the Medfield Big Blue 64-43 Tuesday evening in the opening round of the 2016 Edward M. Amaral Memorial Tournament. The Indians (5-1), fresh off a 52-49 win at the buzzer over Whitman-Hanson last Thursday, never trailed, and led by 23 late in the fourth quarter en route to victory. "We got off to a good start," Hanover head coach Nick Hannigan said. "We hadn't traditionally got off to a good start. We've been finding ways to defensively but our offense hasn't really kicked in, tonight it did." Hanover darted out to a quick 7-2 advantage to force a Medfield (3-1) timeout with 4:44 remaining in the quarter. Matt Delahunt (26 points, seven rebounds) knocked down a pair of 3-pointers in the first and Patrick Flynn (six points, seven rebounds) pumped in six points and hauled down five boards as Hanover led 21-15 after the first eight minutes of action. Delahunt connected on two more triples in the second quarter, and the Indians took a 35-24 advantage into the break. "He plays strong," Hannigan said of Delahunt. "He's worked on his craft. He's been in the gym all summer shooting. He finally found his stroke tonight." The Big Blue opened the third quarter shooting 1 of 7 from the field, but Hanover encountered its own woes with turnovers, coupled with missed shots, and Medfield trailed 41-30, with 3:08 remaining in the quarter. Hanover captain Zack Chase (12 points) would get the offense going again with back-to-back buckets to push the Indians ahead 48-30. "He's been phenomenal," Hannigan said of Chase. "He's actually our best defensive player. He's one of the best leaders in the entire school." The Hanover bench came on in the fourth to finish the deal for the Indians. "This is one of the deepest teams I've seen in the area," Hannigan said. "When they come in, there is no drop." The Big Blue were led Jake Dubbs, who scored a team-high 12 points in the loss. Guard JP Landry (nine points) did a superb job facilitating the Indians' attack and put forth a stingy defensive effort in the back court. "It's like he has five arms," Hannigan said. "He's the best ball handler I've ever coached. He's so savvy and his IQ is off the charts basketball-wise. He's our quarterback out there." Hanover improved to 3-0 at home as Medfield dropped to 2-1 on the road this season. Medfield will take on Dedham in the consolation game tomorrow at 5 p.m.
Hanover will square off against neighbor Norwell, which knocked the Indians out of the Division 3 South playoffs last season, in the final tomorrow at 7 p.m.
"Their zone is as good as it comes," Hannigan, who coached at Norwell for seven years, said. "Not much needs to be said in the locker room to motivate these kids. They're very well coached, they work hard and they're disciplined."